This tip was inspired by Elizabeth Sekerak, former AmeriCorps member in Northeast Ohio Literacy Corps. The GED® test will only be offered exclusively on the computer at authorized testing centers. You can never take the GED® test online. 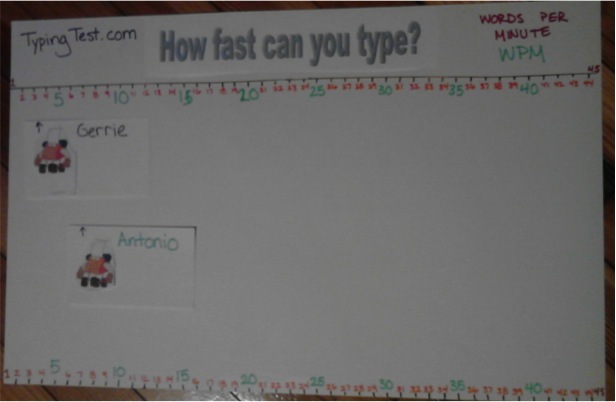 Each Wednesday for 15-20 minutes, my students practiced typing at TypingTest.com. There are lots of ads on the site, so sometimes students found themselves on another website. If that happened, I told them not to click or type, but just stop and raise their hand and I showed them how to go back in the browser or close the pop-up. The site offers a typing tutor product. It is free at first, but later you have to pay, so I told my students not to sign up. (They had me, after all!) But if you are studying at home and struggling, maybe the typing tutor online would be helpful. Just don’t forget to call and stop payments when you’re not using it any more! Choose your language. We use English. Choose to take a test for one, two or three minutes. Choose which story you want to type. Some are more difficult than others due to punctuation or unfamiliar vocabulary. Instructors should try the stories in advance to give recommendations. The website will give you a story and you type every character, including spaces, capitalization and punctuation. You can use delete or backspace to correct errors. At the end of the test, you get a report of your Words-Per-Minute (WPM), which subtracts your errors. Important: The test takes off points for errors. After their first test, I put the students’ index cards on the chart (with their permission) to show their WPM (minus errors). They ranged from 3 to 18. When I put the index cards on the chart, I emphasize that they are not racing each other, but racing themselves to see how much they can improve their own score. “Backspace” or “delete” to correct errors. “Shift” to capitalize letters and type punctuation like , ” – ? ! At first, I told students to practice on the same story over and over. They tried again, and I moved up their index cards on the chart on the first day. Just learning how to type without errors greatly improved their scores. After three weeks, most students almost doubled their WPM! We were very excited to see results go from 3 to 7 WPM or from 12 to 21 WPM. We applaud at the end of each session for students as they move along the chart. But after the initial improvement, the progress was not as dramatic. Do you have any other tips or websites to help improve typing skills? Thanks, David! You have compiled a very useful list.